JNN 22 Feb 2014 Riyadh : Saudi regime forces have attacked and killed two anti-government activists at their home in the Qatif governorate of Eastern Province. The two were killed when regime forces supported by armed vehicles stormed their house the town of Awamiyah. 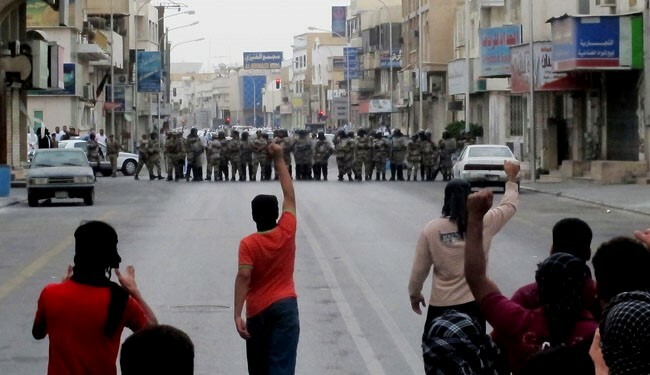 The town has been the scene of violent clashes between anti-regime protesters and Saudi forces for three years. Witnesses said the two were harshly beaten by the regime forces and taken to hospital, where they died. The move is considered as part of a fresh crackdown on anti-regime protests in Saudi Arabia. On Wednesday, a Saudi court in Qatif sentenced seven people to jail terms of up to 20 years for taking part in protests in Qatif. The men were also convicted of chanting slogans against the government as well as possession and making of petrol bombs and throwing them at the security forces. Saudi security forces have attacked anti-regime protesters in the Qatif region of Eastern Province. Security forces used live fire to break up anti-government protests in the town of Awamiyah on Friday. In reaction to the attack, protesters set fire to an armored police vehicle during the clashes. On February 20, two anti-government activists were killed when regime forces supported by armed vehicles stormed a neighborhood in Awamiyah. One day earlier, a Saudi court sentenced seven people to jail terms of up to 20 years for taking part in protests in Qatif. Human rights groups have censured the verdicts and called on Saudi authorities to release the detainees. In October 2013, rights group Amnesty International censured Saudi authorities for not addressing the “dire human rights situation” in the kingdom. Eastern Province has been the scene of violent clashes between anti-regime protesters and Saudi forces for some three years. Riyadh has strictly banned any gatherings across the kingdom. Several people have died in the regime crackdown on protests. This entry was posted in Middle East and tagged awamia, Qatif, Saudi Arabia, saudi authorities, Saudi Forces, saudi regime, security forces, Shia Protesters. Bookmark the permalink. ← Ukraine clashes continue despite initial deal with govt.